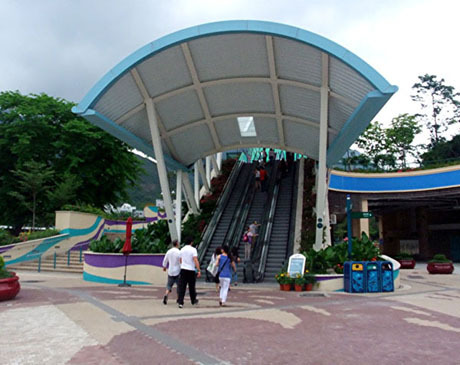 Located at Wong Chuk Hang near Aberdeen on the south side of Hong Kong Island, Ocean Park opened in 1977 and was Hong Kong’s first theme park. The park, which occupies an area of over 87 hectares combines attractions, entertainment, conservation and education. The park was initially a subsidiary of Hong Kong Jockey Club, which funded its construction on land donated by the Hong Kong Government. Since 1987 the park has been managed by Ocean Park Corporation, a financially independent statutory body which operates the park on a "not for profit" basis with a government appointed board of trustees. Following a period of decline in the years up to 2004 when the future of the park was in doubt, attendances in recent years have soared and the park broke its own attendance record eight times in nine years reaching 7.7 million for the financial year ended 30th June 2013, an increase of 9% on the previous year. The financial year ended 30th June 2014 recorded a slight drop in attendance to 7.6 million, attributed to a new mainland law banning "forced shopping" group tours and inclement weather during the beginning of the year and during the financial year ended 30th June 2015 a further drop in annual attendance by about 2.5% to 7.4 million was announced. The spectacular run of growth in attendances until 2013 appears all the more impressive considering the park was expected to face major competition following the opening of Hong Kong Disneyland theme park in 2005. Attendances in recent years have been boosted by visitors from mainland China who now account for about 53% of visitors to the park, which received its one millionth visitor on 18th February 2011. The average daily attendance is about 21,000 but during the peak season of July and August the average daily attendance increases to over 26,000 and 33,000 respectively. During the financial year ended June 2014 the park generated revenue of about HK$2 billion (up from HK$1.857 million for the year ended June 2013) with a net surplus of HK$96 million (down from HK$127.2 million for 2013). For the financial year ended June 2015 revenue was HK$1.968 billion with a net surplus of HK$45.2 million. 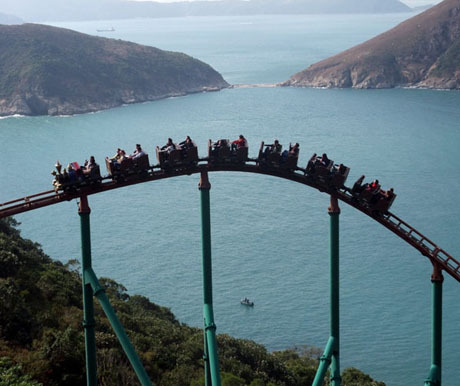 The park suffered a decline in attendance of 18.8% to about 6 million for the fiscal year ended June 2016 owing to the reduction in Mainland China visitors to Hong Kong and the park made a record loss of HK$241.1 million against revenue of HK$1.6418 million. For the financial year ended June 2017 the park increased its revenues to HK$1.619 million and reduced its deficit to HK$234.4 million despite a small drop in attendance to 5.8 million. The financial year ended June 2018 saw a 4% increase in revenue to HK$1,686.2 million although attendance remained unchanged at 5.8 million. 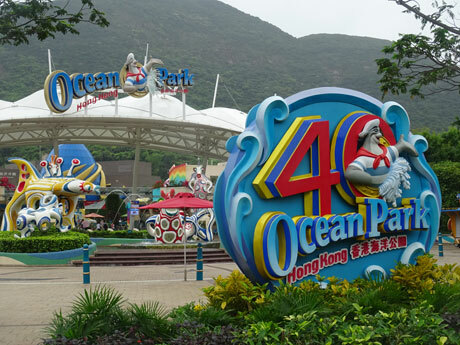 A net deficit of HK$236.5 million was attributed to increased attraction maintenance and operating costs, substantial additional investment in entertainment and hospitality and high depreciation of assets.Ocean Park now employs about 2,000 full-time staff compared to 600 in 2006, and also employs a further 2,000 part-time staff during busy periods such as Halloween. The current capacity of the park is 36,000 but is limited to about 33,000 in the interests of visitor comfort. The park sold out on three days during Chinese New Year 2011, the first time this has occurred since 2005 and during Chinese New Year in 2013 the park suspended ticket sales for part of the day on two days to prevent the number of visitors exceeding the park's own limit for visitor comfort. It is ranked the twelfth most visited theme park in the world and fifth most visited theme park in Asia. Ocean Park has a cooperation agreement with the Chinese mainland's largest marine theme park operator, Haichang, which operates six parks, in Dalian , Qingdao , Tianjin , Yantai , Wuhan and Chengdu. The agreement was extended for three years in August 2014 and in addition to exchanging marine knowledge and aquarium creatures, the two organisations will work more closely in brand-name promotion and marketing, personnel development, animal sustainability and technical knowledge.. 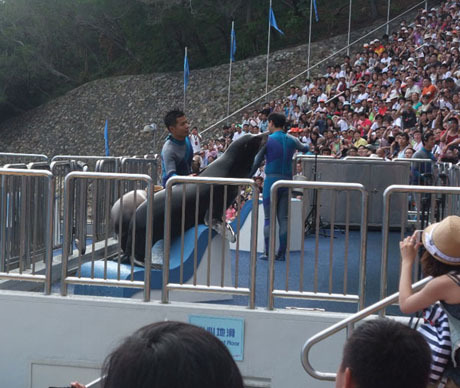 In addition to being a theme park, is also an important marine animal conservation, research and education centre. 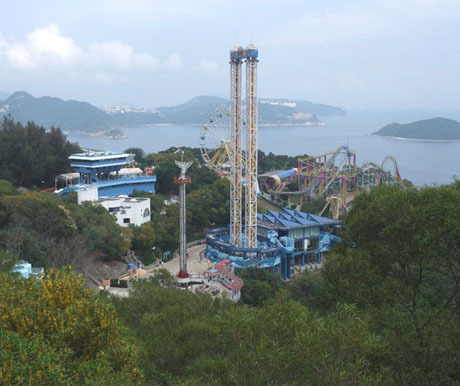 A major HK$5.5 billion redevelopment and expansion programme commenced in 2006 and was completed by mid-2012 which has seen the park double in size and the number of attractions increasing to 70 (see "Ocean Park Redevelopment" below). The park remained open as normal during the redevelopment period. During December 2010 and January 2011 two penguins were born at the park, the first to be bred in captivity in Hong Kong and will joined the park's other 51 penguins on public display when the new Polar Adventure opened in July 2012. A major new zone Aqua City opened on 26th January 2011 and the park also introduced its nightly "Symbio" fire, water and music spectacular at The Lagoon within Aqua City. 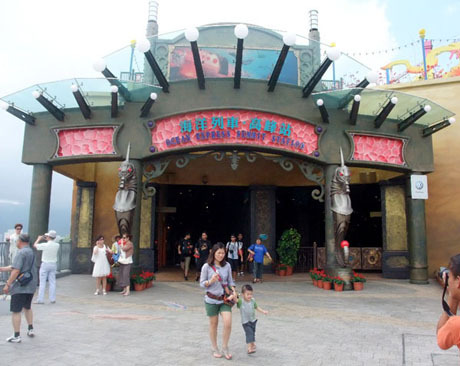 Themed zone, The Rainforest, featuring over 1000 mammals, fish, birds and insects of 70 species and a river raft ride, opened on 13th June 2011. In August 2011, one of the park's dolphins, 27-year old Angel, became the first dolphin in the world to give birth by artificial insemination conducted in water. Two other dolphins have also been born through artificial insemination out of water at the park, which pioneered the procedure. 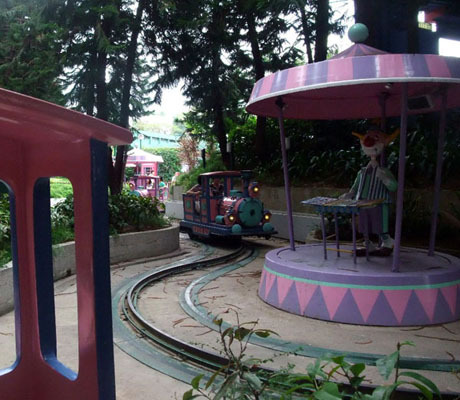 In December 2011 Thrill Mountain, with six rides and eight game booths opened in the area adjacent to the Summit Station of Ocean Express funicular railway bringing the total number of rides to 27. In January 2012, the park celebrated its 35th anniversary and announced a new attraction "Old Hong Kong", which has since opened in March 2012. The 35,500 sq metre attraction features a typical 1950's to 1970's Hong Kong street with tong lau (old tenement buildings), vintage tram, rickshaws, clock tower and colonial police post and includes dai pai dong selling street food, and a Kee Wah Bakery. 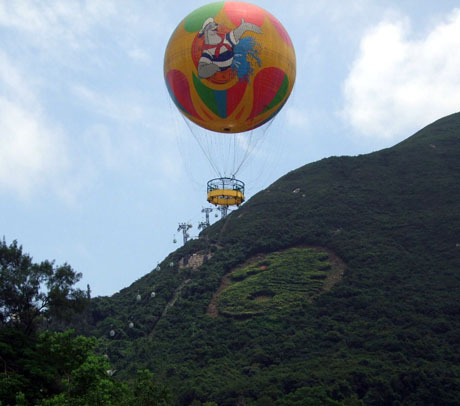 On 28th June 2012 the SkyStar helium ballon ride at the park's SkyFair attraction was taken out of service until further notice following an incident in which 6 people were injured when the ballon deflated. 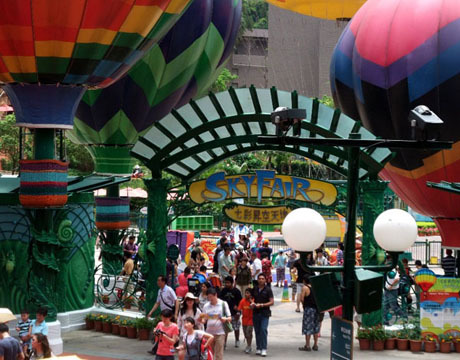 An investigation by the Hong Kong Government's Electrical and Mechanical Services Department established the cause as leaking helium from a rip panel joint in the balloon and Ocean Park has subsequently decided to discontinue its SkyStar attraction. The space will be turned into a venue for events and exhibitions. Ocean Parks' latest themed area "Polar Adventure" opened on 13th July 2012. Eight young koalas are being donated to the park by the South Australian state government and are expected to arrive in 2014 after feed has become available from a eucalyptus plantation being established in mainland China. These are the first koalas to be kept and will be housed in a new habitat and serve as important conservation ambassadors. In December 2012, the first king penguin to be bred at the park was born. This was followed by a gentoo penguin chick, born in January 2013, taking Ocean Park's penguin population to 76. In April 2013, the park introduced a new "Unique Experience" allowing qualified participants to scuba dive in the Grand Aquarium, with sessions being held for a maximum of six people each Saturday afternoon. In September 2013, six female hammerhead sharks died within a space of 7 hours as a result of a malfunction of an ozone machine. The 5-year sharks had been among a group of 15 hammerhead sharks acquired by the park from Japan in 2010. Ocean Park's latest attraction "Shark Mystique", featuring over 100 sharks, opened on 26th June 2014. Located in the Marine World area of the park at The Summit, the attraction features over 100 sharks and rays in a walk-through aquarium spiralling down three levels enabling visitors to view the fish from a 360-degree perspective. The aquarium is five times the size of the previous shark aquarium. In July 2014, the park confirmed it is intending to develop a smartphone app to enable visitors to book some rides in advance to avoid long queues. The app will also display current waiting times for rides and enable advance restaurant bookings. The app will be on a much larger scale than an app which was introduced during the 2013 Halloween Fest which allowed visitors to make advance bookings for the Haunted House and some other rides. A free Wi-fi network will also be available throughout the park by mid-2015. In September 2014 it was announced that a captive bred Chinese sturgeon, which was one of one of 15 donated to Ocean Park in February 2014 by Yangtze River Fish Research Institution, had become the third of the group to die from a bacterial infection. The sturgeon had been quarantined and placed under intensive care since the loss of two sturgeons in April and May 2014. In March 2015 Ocean Park opened its "Adventures in Australia" exhibit featuring three koalas and other Australian species including red-necked wallabies and laughing kookaburras in a space modelled on the South Australian outback with eucalyptus trees. The exhibit allows a maximum of 100 visitors at a time. In October 2016, Ocean Park's giant panda, Jia Jia, age 38 and the world's oldest giant panda in captivity, was euthanized having suffered age-related health deterioration. 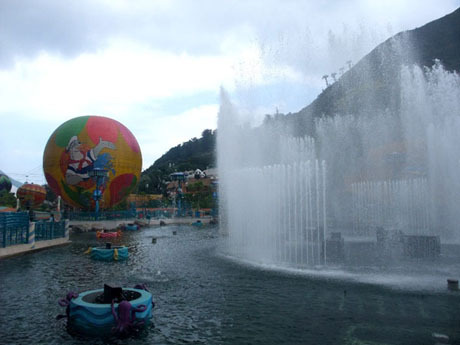 In the Hong Kong Government's 2013/2014 budget it was announced that the government will offer a loan of HK$2.3 billion to Ocean Park to build a new all-weather attraction, Water World, at Tai Shue Wan. There are 27 attractions planned including a pool with natural beach, 13 giant water slides, the world's longest lazy river and a hot spring. Water World will have extensive sea views and will be built into a series of terraced platforms to blend in with the natural surroundings of Tai Shue Wan. Unlike Ocean Park's old water world, which closed in 1999, the new Water World will open all year round and will remain open in the evenings during the peak season, with shows and live entertainment planned. Admission tickets will be sold separately to those for the main park, with a daily capacity of 15,000 visitors and a maximum of 7,000 at any one time. Ground breaking for the project took place in November 2015 but the completion date, originally planned for mid-2017 has been delayed until the second half of 2018. In November 2015 a cost overrun of HK$650 million was confirmed, for which non-governmental funding has been arranged, making the revised cost of the project HK$2.95 billion. A park wide high-speed Wi-Fi network with around 400 hotspots has been available since March 2016 with unlimited free access for visitors. An upgraded mobile phone app, also launched in March 2016, includes an "escheduler" function which automatically designs an itinerary in accordance with registered visitors attraction choices and allocates time slots to saves queuing time for certain attractions. A 750-room hotel “Hong Kong Ocean Park Marriott Hotel”, developed by Lai Sun Development and operated by Marriott International is expected to open in mid-2018 at the park's main entrance. A second hotel, The Fullerton, is being developed at the Tai Shue Wan side of the park by Parkland Hong Kong, a joint venture between Sino Land and Empire Group, with the hotel being operated and managed by Sino Hotels and expected to open in 2021. Direct access to the park by MTR train became possible when Ocean Park Station, on the MTR South Island Line (East), a 7km line running from Admiralty to South Horizons on Ap Lei Chau, opened on 28th December 2016. Ocean Park Station, opened 28th December 2016, is located about 2 minute's walk from the park's entry plaza. The station is served by the MTR South Island Line which opened on the same date and is 6-minute's journey time from Admiralty Station, interchange station for MTR Island Line and Tsuen Wan Line as well as the South Island Line ans about 14 minutes journey time from Tsim Sha Tsui Station. Trains, which are fully automatic and driverless, operate at about 3-minute frequency. NWFB ROUTE 15R (from Ocean Park only to The Peak - Saturdays, Sundays and public holidays from 17th November 2018. Owing to low patronage this service no longer operates after 10th March 2019). Ocean Park is located a short walk from the Aberdeen Tunnel entrance/exit on the Aberdeen side. 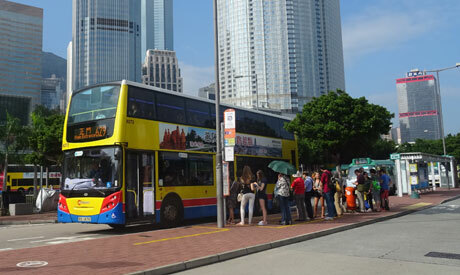 There are numerous very frequent bus services from early morning until late night from Central, Admiralty, Wan Chai, Causeway Bay and parts of Kowloon and the New Territories which either pass the main entrance to the park (if heading towards Stanley) or about 3 minutes walk from the main entrance (if heading towards Aberdeen). 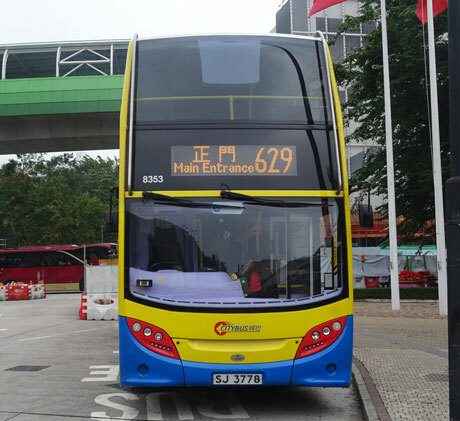 On all services the stop to disembark for Ocean Park is the first stop immediately after the bus exits the Aberdeen Tunnel. Ocean Park is clearly signed from these bus stops. However, on Sundays and public holidays only, routes 48, 107, 170, 171 and 973 make a short diversion and call at Ocean Park Bus Terminus. Extended opening hours operate for certain special events such as Ocean Park's Halloween Bash. Check Ocean Park website for details. Admission tickets can be purchased at the ticket booths at main park entrance. Advance booking of tickets is not usually necessary. "Electronic" tickets, valid for one month, can be purchased at all 7-11 convenience store outlets in Hong Kong. These tickets contain a barcode which is scanned at the Ocean Park Main Entrance turnstiles allowing instant entry and eliminating the risk of queuing at Ocean Park's ticket booths. Tickets may also be purchased from MTR Travel Services Centre at Admiralty MTR Station. Tickets can be purchased online up to 90 days in advance via the Ocean Park website online ticketing facility. Online tickets can be collected at either park entrance provided they are booked at least one day prior to collection or can be despatched by courier, allowing 5 days for delivery if to a Hong Kong SAR address or 7 days for addresses outside Hong Kong. Senior Citizens - There is a concession of free entry for seniors aged 65 or over but this is restricted to Hong Kong Identity Card or Senior Citizen Free Card Holders only. The park is divided into two sections, "Waterfront" (formerly “Lowland”) and Summit (formerly “Headland”) on opposite sides of a hill, Nam Long Shan (Brick Hill). Waterfront and Summit are connected by a 1.8km cable car system and a 1.3km themed funicular railway, Ocean Express. NEW MAIN ENTRANCE. The entrance opened in January 2011, when both the park's adjacent old main entrance and Tai Shue Wan entrance, on the Summit side of the park, closed. The Tai Shue Wan entrance is now only used occasionally for certain special events or for crowd control purposes at peak times such as Chinese New Year. AQUA CITY is a major new zone which opened in January 2011 as part of the park's major redevelopment and expansion programme. Ocean Square lies immediately inside the new main entrance of the park and features sculptures of sea creatures and fountain. 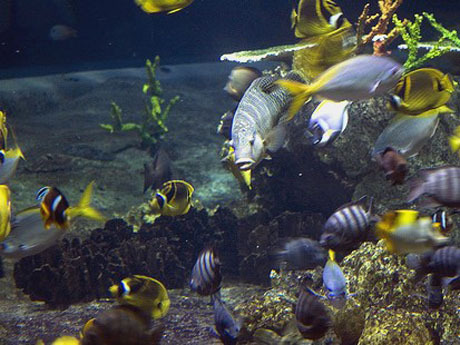 The flagship attraction is The Grand Aquarium which contains over 5000 fish of 400 species and 5.2 million litres of water, double the size of the old aquarium. The three-storey walk-through aquarium includes a Reef Tunnel, swirl tank, bubble tunnel and the world's largest viewing panel, 13-metres wide and 5.5 metres high. Species include rare fish such as Pacific bluefin tuna and the endangered Napoleon fish. Neptune's Restaurant allows diners to eat whilst being circled by fish. Aqua City also features The Lagoon which features dancing fountains and Symbio, a nightly 360°water screen show set to music in which two 9m-tall fiery dragons clash on screen. Aqua City Lagoon. The lagoon is the setting for the nightly spectacular fire, pyrotechnic, water and music show "Symbio"
The zone also has over 15,000 square feet of retail space where shops include Aqua City Bakery, Waterfront Gifts (apparels and accessories), Celebrity Store (decorative gifts, hard goods, plush toys and kids’ corner), Ocean’s Charms (jewellery) and Aqua City Crafts (premium gifts), Ocean Park’s very first personal health and beauty product store, Ocean Potions, and Shutters, a photography studio. HONG KONG JOCKEY CLUB SICHUAN TREASURES, located in the renovated former Hong Kong Jockey Club Giant Panda Habitat. In April 2012, two golden monkeys, Le Le (3yrs old) and Hu Hu (2 yrs old), on loan for a three-year period from Chengdu Zoo in Sichuan Province, were put on display. The golden monkeys are considered national treasures in China. They occupy an enclosure alongside the elderly Giant Pandas An An (born 1986). Jia Jia, the park's 38-year old giant panda, born 1978 and world's oldest giant panda in captivity at the time was euthanized in October 2016 following age-related deterioration in health. Both pandas were born in mainland China and donated as a gift to Hong Kong by the Chinese Government. No decision has yet been made as to whether a request for another giant panda will be made. 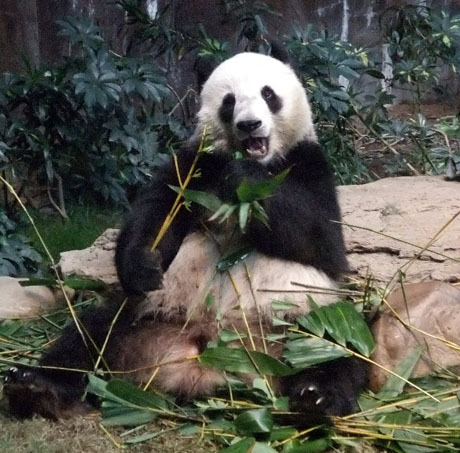 Until April 2009 the two elderly pandas had shared the enclosure with two young pandas, Ying Ying and Le Le, which have since been moved to the Amazing Asian Animals enclosure. AMAZING ASIAN ANIMALS opened in April 2009 and cost over HK$100 million. The 25,000 sq metre enclosure is covered with the same translucent material used for the "Water Cube" at the 2008 Beijing Olympics and temperature is controlled at between 18C and 25C. 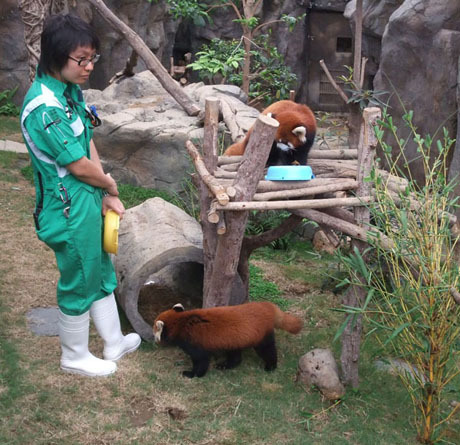 The enclosure is home to Ocean Park's two young Pandas Ying Ying and Le Le (both born 2005), four Red Pandas (two males Tai Shan and Cong Cong and two females Rou Rou and Li Zi) on loan from Chengdu Research Base of Panda Breeding, Chinese giant salamanders, Chinese alligators, otters, goldfish, birds and turtles. The enclosure includes a 2000 sq metre "sunlit" space for the pandas featuring fish ponds, a "snow" area and vegetation. AMAZING BIRD THEATRE, a walk through South American themed garden with colourful exotic birds including Macaws, Eagle Owl, Steppes Eagle, Cranes and other exotic birds. "Emperors of the Sky" aerial show takes place here four times daily. OLD HONG KONG, covering an area of 35,500sq ft, opened in March 2012 near the Waterfront cable car station is a nostalgic re-creation of a Hong Kong street scene from the 1950's to 1970's including rickshaws, a cinema decorated with old movie posters, tong lau (old Hong Kong-style tenements), a static replica of Hong Kong tram 120 with rattan seats, an old KMB bus colonial pillar boxes, an old police post, clock tower and Kee Wah Bakery. The street is lined with dai pai dong food stalls offering over 70 types of classic hawker food and performers play the roles of period characters. KID'S WORLD includes the Whiskers Theatre where a Sea Lion Show and Whiskers and Friends Show are performed several times daily and where kids can join in the fun, Gator Marsh, Whiskers Harbour Playground, Emerald Trail, Goldfish Treasures, kids rides including Toto the Loco and Merry-go-Round and coin-operated remote-control model boats and racing cars. WATERFRONT CABLE CAR TERMINUS for the 12 minute cable car journey to the Summit with breathtaking views over Deepwater Bay, Stanley Peninsula, and Lamma Island. Opened in September 2009, Ocean Express is a 1.3km funicular railway through a tunnel linking Lowland area of the park with the Summit area. The train is designed to resemble a submersible vehicle and the three minute ride simulates a journey through the depths of the ocean. 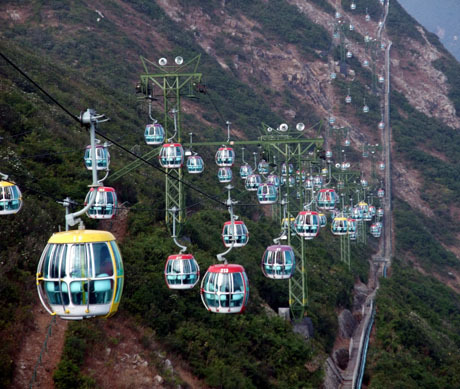 The attraction, which can transport up to 10,000 passengers per hour in each direction, forms part of Ocean Park's redevelopment and expansion programme and provides an alternative method of transportation to the cable car for travelling between the two main areas of the park. OCEAN EXPRESS SUMMIT STATION is the arrival/departure point for visitors using the Ocean Express funicular railway to transfer between Waterfront and Summit and is fronted by The Summit Plaza. SUMMIT CABLE CAR STATION is the arrival point for visitors transferring between Waterfront and Summit by cable car. There are panoramic views across the park and south coast of Hong Kong Island from the terrace outside the station. MARINE LAND in the area around the Ocean Express Summit Station and Summit Cable Car Terminus includes Sea Jelly Spectacular, a jellyfish exhibit with music, lighting and multimedia special effects, Chinese Sturgeon Aquarium - Yangtze Exploration which opened in June 2010 and features ten Chinese sturgeon aged from 2 to 10 in a simulated Yangtze River environment. Garden of Joy is a picturesque landscaped Japanese garden with streams, bridges, greenery and koi fish. Shark Mystique, opened June 2014, features over 100 sharks and rays in a walk-through aquarium spiralling down three levels enabling visitors to view the fish from a 360-degree perspective. THE RAINFOREST, opened in June 2011, is a themed zone with over 1000 mammals, fish, birds and insects of over 70 species. These include the world's smallest monkey, the pygmy marmoset which can be as small as 12cm in length, the South American kinkajou which hangs by its tail whilst seeking food, the world's largest toucan, the world's strongest beetles, tamarins and a herd of capybara, a rodent of the guinea pig family, which can grow to 1.34 metres in length. The Rainforest also features a raft ride which courses its way along a river whilst other visitors take aim at the rafts with water guns. POLAR ADVENTURE, opened July 2012, is Ocean Park's latest themed zone and features northern sea lions, three different species of penguins, Pacific walruses, spotted seals, four one-year old snowy owls and Arctic foxes in two themed areas, South Pole Encounter and North Pole Encounter. The zone also includes a roller coaster ride, Arctic Blast, and Tuxedos Restaurant which has panoramic views of the penguin pool. 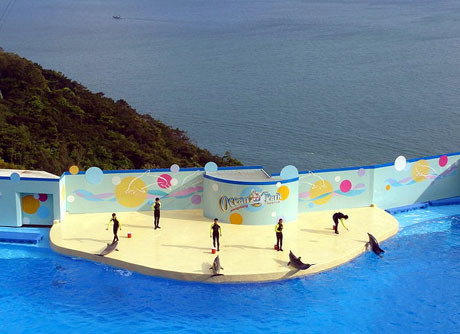 OCEAN THEATRE is the venue for "Sea Dreams", the popular spectacular dolphin and sea-lion show where these mammals perform with their trainers three or four times daily. Arrive early to be sure of getting a seat. Ocean Theatre dolphin and sea-lion show "Sea Dreams"
OCEAN PARK TOWER situated between Marine Land and Summit Rides is a rotating viewing platform rising 72 metres from which there are panoramic views of the park and coastline. 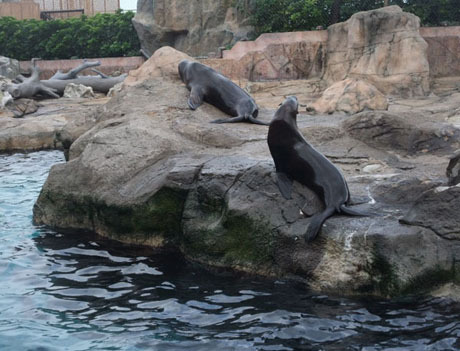 PACIFIC PIER is a rock-lined pool with about 20 sea-lions and harbor seals surrounded by a boardwalk where visitors can listen to a trainer's talk and join in feeding sessions once or twice daily. Summit rides include The Abyss turbo drop which hoists victims up to a height of 185ft before unleashing a stomach churning freefall drop, The Dragon cliff-edge roller coaster ride, Crazy Swing, The Eagle swinging gondola ride, Crazy Galleon Pirate Ship swing reaching a height of 20 metres, Ferris Wheel and Headland Games which include Ring Toss, Goblet Toss and Hi-Striker. 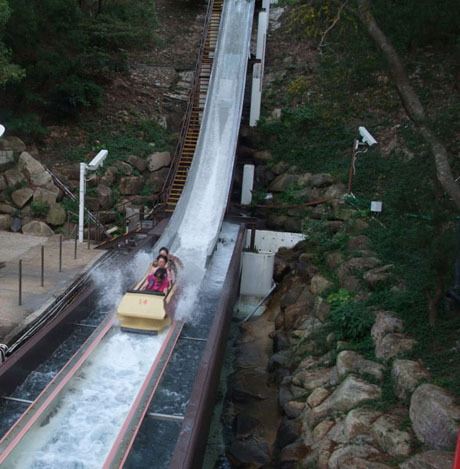 ADVENTURE LAND has more rides including Mine Train, a rollercoaster ride reaching a height of 85 metres, Space Wheel orbiting vertical wheel gondola ride and Raging River boat ride. RAGING RIVER is a log-boat ride through channels, and past waterfalls, rapids and ravines culminating in a vertical plunge at over 58km per hour. THRILL MOUNTAIN, opened in December 2011, is the latest new zone to open under Ocean Park's expansion and redevelopment plan. Located next to the Summit Station of Ocean Express funicular railway and occupying an area of over 222,000 sq ft, the zone has six thrill rides, eight booth games and food and drink outlets. Highlight is Hair Raiser, Hong Kong's first floorless roller coaster which hurls riders through multiple inversions reaching 4.0G acceleration and 88km per hour maximum speed. 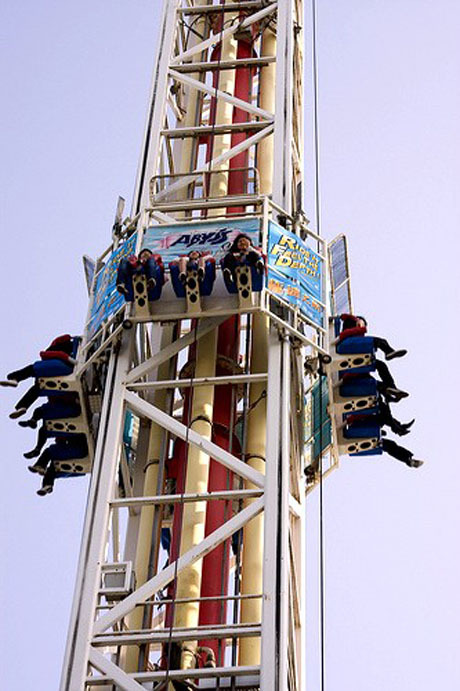 Other rides include Whirly Bird, an aerial swing ride, Rev Booster, Bungee Trampoline, Bumper Blasters and The Flash, a pendulum gondola which rotates through 360 degrees. 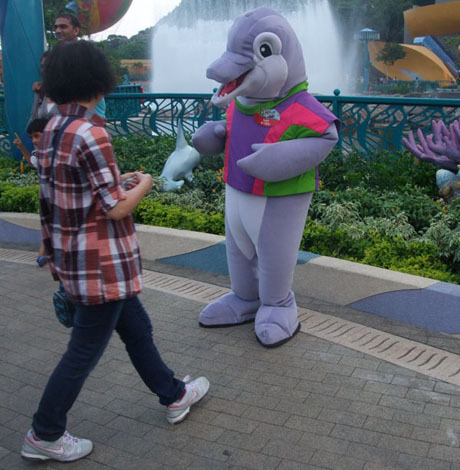 The park’s mascot Whiskers, a friendly sea-lion and other characters can usually be seen around the park and there are character greeting venues where visitors can meet these characters at specific times. TUXEDOS - international cuisine including low carbon menu. 11am to Summit closing time. CAFE OCEAN - located next to "The Abyss", Hong Kong-style traditional specialities including BBQ pork bun, Hainan chicken and curry-styles from Hong Kong, Thailand and India. 11am to 5pm. There are 17 food kiosks throughout the park selling fast food and drinks. These include MacDonalds, Boardwalk Cafe, Pizza Place, Noodle2, Golden Fried Chicken and Ice Cream Delight. Ground breaking for the 6 year HK$5.5 billion redevelopment programme mentioned above commenced in 2006 and was carried out in eight phases, being completed in July 2012. AMAZING ASIAN ANIMALS opened in April 2009 and OCEAN EXPRESS, a 1.3km funicular train connecting the WATERFRONT (formerly "Lowland") and SUMMIT (formerly "Headland") opened in September 2009. The rail system is capable of transporting 5,000 passengers per hour in each direction on the 3 minute journey. 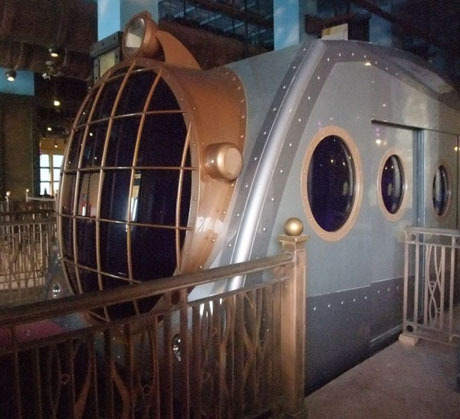 Featuring a Swiss-manufactured train resembling a 19th-century explorers submarine the train journey simulates an undersea adventure. The rail system in addition to being an attraction provides an alternative method of travel between the two main areas of the park in the event of the cable car system being disrupted by adverse weather. In June 2010 a Yangtze River themed attraction CHINESE STURGEON AQUARIUM - YANGTZE EXPLORATION opened featuring ten Chinese sturgeons in a simulated Yangtze River habitat. The Waterfront area contains three themed zones, AQUA CITY, AMAZING ASIAN ANIMALS and WHISKERS HARBOUR. AQUA CITY and its flagship attraction GRAND AQUARIUM opened on 27th January 2011 and includes The Lagoon, where the nightly Symbio fire and water show takes place and an underwater restaurant, NEPTUNE's serving high-quality Japanese seafood. The Summit will contain MARINE WORLD, THE RAIN FOREST (opened June 2011), THRILL MOUNTAIN (officially opened 8th December 2011) with six thrill rides and eight game booths. POLAR ADVENTURE, the final new themed zone opened on 13th July 2012. There are also be night shows and attractions and park opening hours have been extended. In January 2012, the park celebrated its 35th anniversary and announced a new attraction "OLD HONG KONG", which opened to the public in March 2012. The 35,500 sq metre attraction features a typical 1950's to 1970's Hong Kong street with tong lau (old tenement buildings), vintage trams, rickshaw, clock tower and colonial police post and will include a dai pai dong selling food, and a Kee Wah Bakery. Ocean Park has announced plans for further development including hotels and a new water park - see “FUTURE DEVELOPMENT” above.